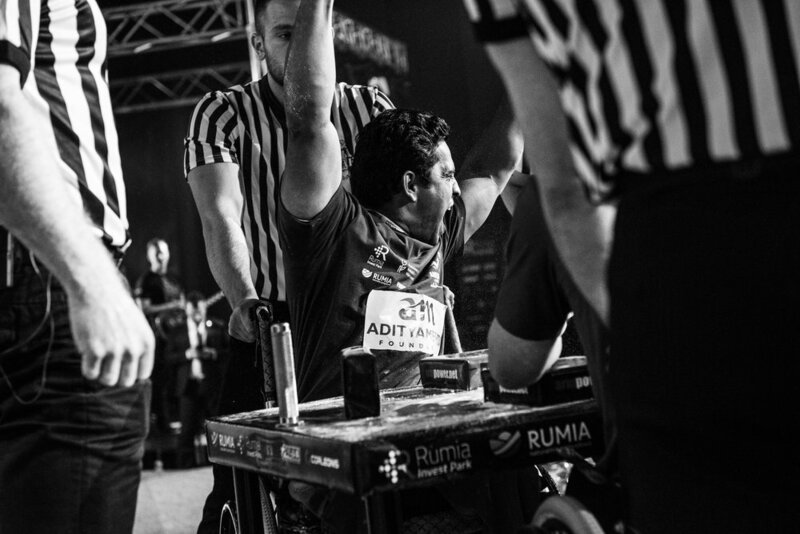 Strength and focus; pride and determination; emotion and endurance – all these words can be used to speak of para-armwrestling. But what words may fail to transmit, photography captures with clarity and in elaborate visual narratives. UK-based photographer Tomasz Wisniowski turns his lens towards para-armwrestling, managing to isolate split-second moments of quick, memorable fights. The result – a visual saga that escapes categorisation; the photographs are simultaneous portraits of incredibly strong individuals and records of exciting competitions, all traversed by a clear intention to emphasise the intensity of the sport. Elena Stanciu: How did you become interested in arm wrestling? Dominik Zaorski (16, Poland): My father took me to my first training session when I was 10. I immediately loved it. Eric Hoppe (39, Germany): I am generally enthusiastic about sports; I used to train in boxing, but because of my disability (right-side body paralysis), I could only train strength, not fight. I turned to arm wrestling when I saw the movie “Over the Top;” my father wrestled one of the athletes who appeared in the film and beat him. This inspired me. Eric Komar (34, USA): I have always used my arms to move around using crutches or a wheelchair. 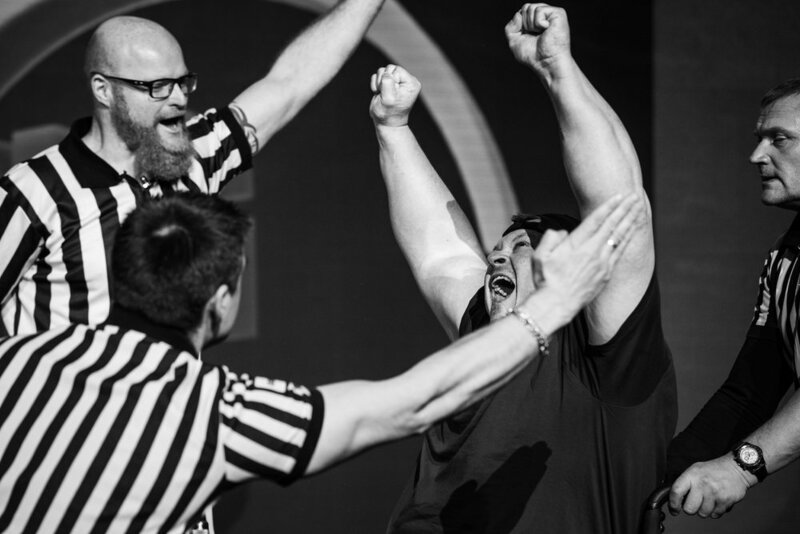 I arm wrestled other kids in high school and thought that I might be successful in the sport. Vyatkin Sergey Nikolaevich (39, Russia): I’ve been doing sports for 26 years, and after my injury in 2006, I turned to arm wrestling. Nadezhda Vnenkovskaya (18, Russia): I was introduced to this sport by accident but became instantly fascinated. It is especially interesting to watch women compete; during the struggle the girls are extremely focused and show incredible energy and beauty. Nikolai Tatevosyan (36, Ukraine): Sports have always been in my blood. I came across a video of two guys in wheelchairs competing in arm wrestling and thought: “Am I not able to do this?” I found that I was. Sargis Stepanyan (36, Armenia): I have a military background and did weightlifting for 10 years until 2007, when I began my service for the Ministry of Defence of Armenia. After my injury, my friends helped me find out what sport would be best for me. I decided on arm wrestling. ES: Is there something in particular about the sport that brings you special satisfaction? DZ: It's a great sport. My successes improved my self-confidence and strength, both physical and mental. I know I am well-liked among other competitors. It’s a strong community. EH: Arm wrestling gave me confidence and recognition of my peers. I have my own club in Baden Bison, currently the biggest club in Baden-Wurttemberg. I train every week with the members of my club. We respect one another, regardless of nationality, skin colour, or religion. Sports are a great way to overcome barriers. 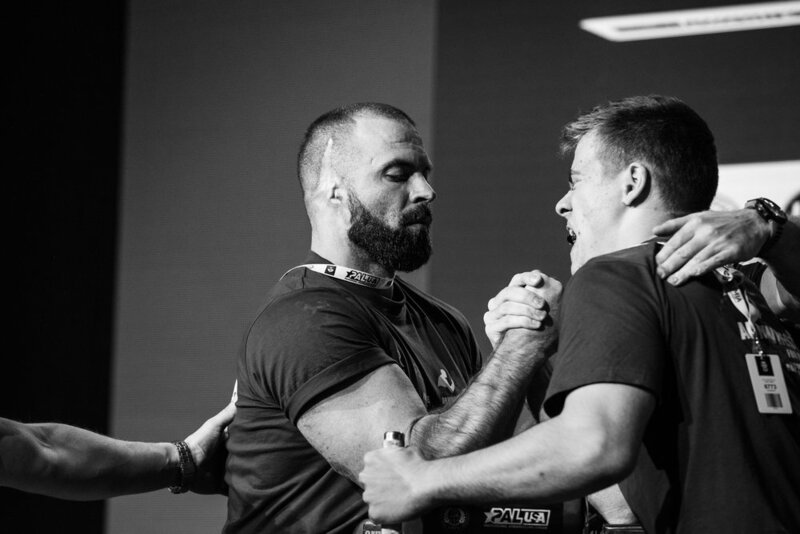 EK: I enjoy the fact that strength in my arms is a natural gift that I can use to have success in the sport. It has brought me great pride to represent my country and to inspire other young athletes with disabilities. VSN: For me, the uniqueness of it is that I need strong hands, but also a strong spirit. To fight with the hands, no equipment is needed: here rivalry goes not only with the opponent, but also with yourself. NV: It’s very satisfying to win, of course. I can’t put that feeling into words. In international competitions, it’s really moving to have the flag of my country and hear the anthem. I feel a part of the team, and know that I mean something to them, and that they are there for me. SS: The sport is unique in that you instantly feel the taste of victory. All fights last a few seconds and within these few seconds the winner is determined. ES: How would you describe the sport to somebody who's never seen a tournament? DZ: Many people think that this is some sort of pub game, but it’s a true combat sport, requiring great concentration, technique, and strength; there is injury and pain. Personally, I love the fact that I can wrestle non-disabled opponents and still win. EH: Arm wrestling is not about strength only: you also need ambition, will and lots of training. Technique and motivation also play a role. EK: The sport involves much more technique than people may realise. There is more to it than pushing your opponent’s hand to the pin pad. Timing is essential; there are wrist movements and body position adjustments necessary. You must train your body in ways that are unique from any other sport. NV: I would describe my feelings, rather than the technical aspects; tell the story of how the sport evolved and transformed. SS: This is one of the only sports where you can very easily, without shedding blood and without hurting your opponent, find out which one of you is stronger. ES: What does a typical workout session look like for you? DZ: It's mostly all about honing your technique using a table, strength training and sparring, which allows you to gain experience. EH: I train about six hours a week. I start with a warm-up, using rubber bands. Then I train my wrist, with special training machines. We spar two times a week, working on our starting speed and technique. 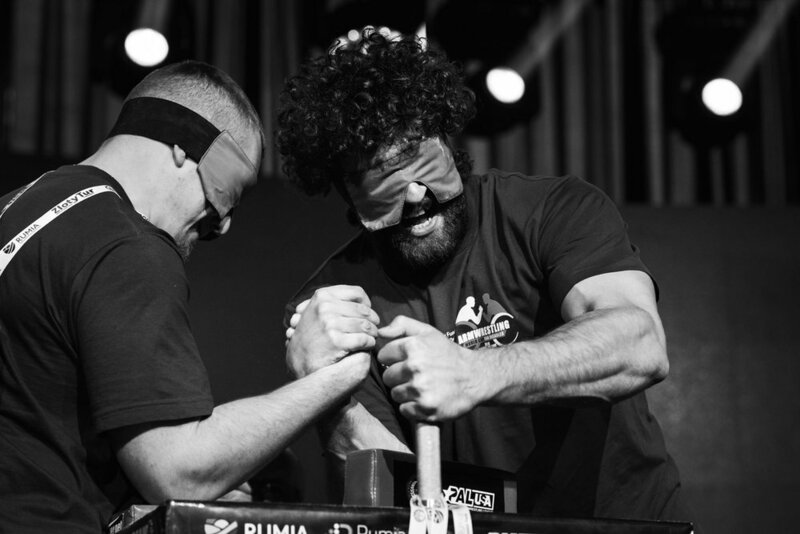 EK: I use weights, resistance bands, hand grippers, and a pull-up bar to do all of the standard arm wrestling exercises. I try to focus on endurance and reaction time. NV: For me, it’s important to be on the same page with the coach, but also to learn new things, and work on mistakes. Using dumbbells that weigh a little less than my body, sweating like never before, stretching my legs and understanding that there is no more strength left for the day – this is all part of it. Nikolai Tatevosyan: In connection with my illness and my physiology, I don’t have a quick start and all my fights are long and spectacular. My workouts are done with big weights or a lot of repetitions, because with my fighting technique I must be stronger and tougher than my opponent. ES: What are your long-term goals in this sport? DZ: My dream is to become World and Olympic Champion, as I know that our sport will be included in the Paralympics. I believe I can be the best arm wrestler in the world, thanks to the love and support of my family, especially my dad. EH: Obviously, my long-term goal is to be in the international top. But I also work to popularise the sport among disabled people. I am currently coaching three wheelchair-bound athletes. I show them that sports help get through rough patches in life. 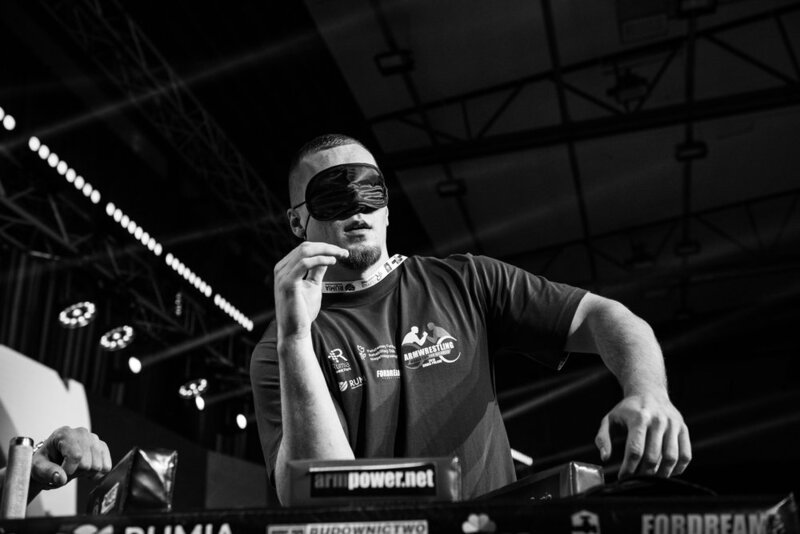 EK: I would like to be a part of great change, and see arm wrestlers with disabilities compete in a disabled division of Zloty Tur. I would also love to be a part of the very first sit-down Vendetta super match. VSN: My dream is for our sport to become a Paralympic sport, and for me to win the competition. NV: University is on my list – Faculty of Physical Education, with an Arm Wrestling Trainer specialty. I want to help people like myself find a way in life; instil in them a love for an active lifestyle, so that fewer people would sit at home. I want to show them they can leave their comfort zone, find friends, and build their destiny as significant members of society. NT: My plans are to earn the title of Honoured Master of Sports in Ukraine and wait for arm wrestling to be recognised as an Olympic sport. ES: There is and undergoing discussion concerning including arm wrestling in the Paralympics programme. What changes would that make in the community of contestants you are a part of? DZ: This is great news and a dream for many. It would certainly mean more recognition for our sport and bring in more people. Besides, disabled people, such as me, show the world that our limitations are no obstacle in everyday life and successes. EH: That would be a huge step forward for the sport, especially because in Germany it’s only Olympic sports and disciplines that get sponsors and support. 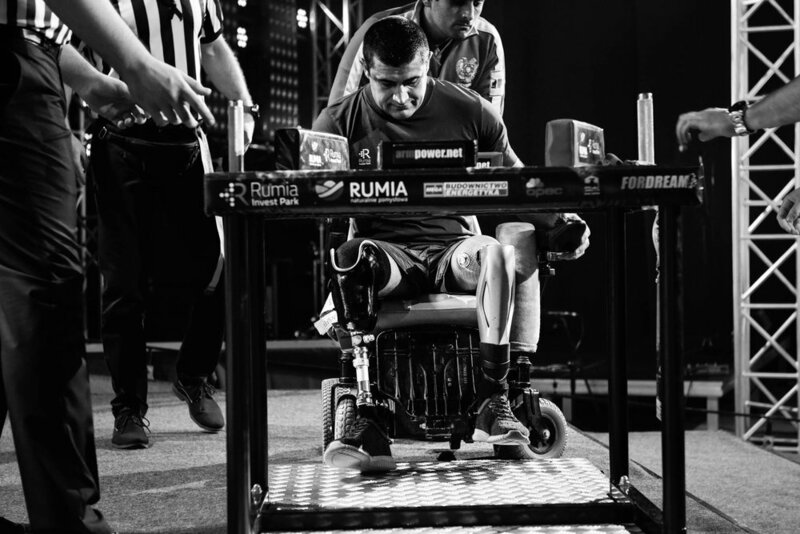 EK: Being a Paralympian is a life-long dream of mine, and the thought of being the first ever arm wrestler to represent my country in the Olympics would be a dream come true. I would hope that it would pave the way for arm wrestling to become part of the typical Olympics in future years, so that my friends without disabilities could proudly represent their countries. NT: There will be more stringent conditions for classification, which will allow all disabled people to fight in equal conditions. Sargis Stepanyan: It will be a very big impetus to the development of arm wrestling throughout the world. Despite the fact that international tournaments now have many weight, age, and various other categories, I am sure that there will be many more and all the athletes with disabilities will find categories where they can fight each other on equal terms.